The Medicare Access and CHIP Reauthorization Act of 2015 (MACRA) has replaced the Sustainable Growth Rate (SGR), a fee-for-service reimbursement program that paid clinicians based on volume, not quality. This decision was adjudicated in order to improve the value and quality of care provided to Medicare patients. If you are an eligible clinician that participates in Medicare Part B, you are part of the initiative to provide high-quality care to individuals enrolled in this healthcare plan. 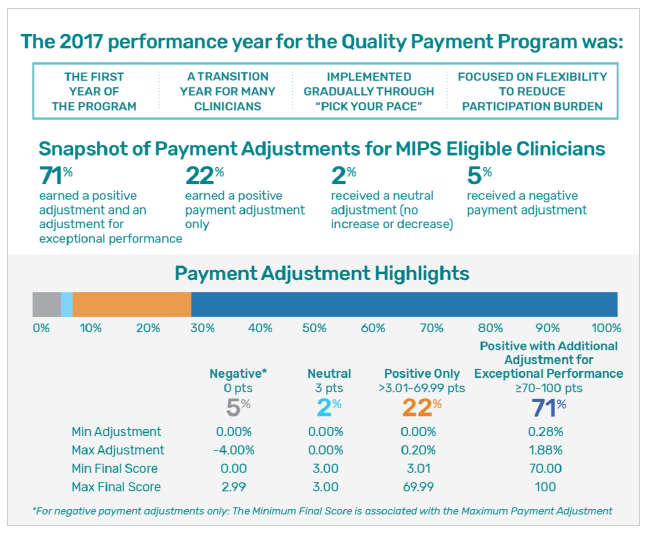 The Quality Payment Program integrates existing incentive payment programs into a new reimbursement structure referred to as the Merit-Based Incentive Payments System (MIPS) as well as provides incentive payments under Advanced Alternative Payment Models (APMs). Clinicians will follow one of the two tracks, MIPS or APM. Most clinicians will report under MIPS. For more information on the APM payment track, click here. To learn how to fulfill requirements for each performance category, click here. Who Will Participate in MIPS? How Will Reimbursements Be Affected by Your CPS? Adjustments may be positive, negative, or neutral, depending on your CPS. A CPS below the performance threshold will yield a negative adjustment, while a CPS equal to or above the performance threshold will result in either a neutral or positive payment adjustment. The first payment period will adjust reimbursements by 4%. The adjustment amount will increase each year, until they reach 9% in 2022. Eligible clinicians who report exceptional performance may receive an additional bonus, not to exceed 10%, if they are in the 25th percentile that receives a CPS above the performance threshold. How does MIPS Differ from PQRS and Meaningful Use? The percentage of which payments can be adjusted will increase each year through 2022, capping at 9%. It is in clinicians’ best interest to prepare for MACRA/MIPS in order to fully participate as soon as possible. With a designated team of MIPS representatives, 1st Providers Choice certified EHR software and practice management software can help guide your practice to meet MACRA/MIPS requirements so you can receive maximum reimbursement. For more information or for a free demonstration, contact us online or call us at 480-782-1116.